I wanted to show you guys all of the new Lelutka skin but I was distracted by these shopping goodies instead. YES THERE IS NEW LELUTKA SKIN COMING THIS FRIDAY. zOmg!zOmg!!! You’ll have to wait for it on the next post! 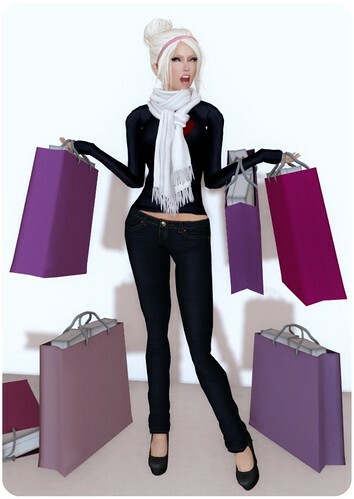 Now focus on these new Glitterati Shopping poses & props. I’m just a couple of days late on this — but this Glitterati Shopping pack is so adorable!! It was a 50L Friday item, but it may be available in the store now (or later). I’m not too sure if 50L items are exclusive or not, so you’ll have to double check! This is pretty much how I imagine my avatar looks if she had to shop around SL carrying bags and bags of goodies instead of simply unpacking boxes. Happy times! All shopping bags & boxes seen here are included. Do you have a Landmark to Mr. Poet? I would like to get that scarf but I can not find the LM in world. Thanks.